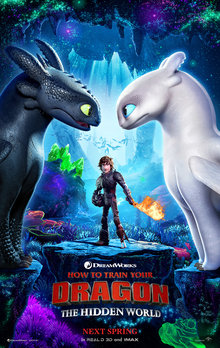 After achieving his dream of establishing Berk as a utopia where dragons and humans can live in harmony, Hiccup and his dragon best friend Toothless encounter a new threat that forces him to lead the people of Berk away from their homes, on a journey to find the mythical Hidden World. The first two How to Train Your Dragon movies have set the bar high for DreamWorks as their greatest franchise, with emotional and visual quality that reaches near the heights set by the works of Pixar, unlike more playful animated comedies they’ve made like Madagascar or The Boss Baby. The Hidden World is a marvelous conclusion to this excellent trilogy, one that I remember watching the beginning of on the very first day it was out, nearly nine years ago. Along with lovable dragons like the absolutely adorable Toothless (who also has a girlfriend now), the voice cast kills it, including Jay Baruchel as a young man trying to bring together his love and compassion for the dragons with his duty to lead Berk as chief, as well as bigger headliners such as Cate Blanchett, Craig Ferguson, and Gerard Butler. The one character I did not encessarily enjoy was the villain — unlike the villain from the 2nd movie, this one is rather annoying than threatening, and his motivation and presence weren’t strong enough on screen to care. The only reason to hate him is because his goal is to hurt Toothless. But otherwise, the story is packed with plenty of emotion from the main characters and sweet sequences that remind us why we love this ode to the friendship between a human and a mythical creature. There are lots of intense moments but enough heart and action for all audiences to enjoy. And to top it all, the animation is absolutely stunning and makes this a must on the big screen and in 3D. The visual appeal outdoes every past DreamWorks project and every scene, from the ordinary scenery to the vivid Hidden World, is done so beautifully. I was constantly in awe during the film, and watching this in theaters is an experience that shouldn’t be missed. There are some fantastic emotional moments that finally lead up to a satisfying conclusion to the trilogy, that will hit you right in the heart and leave you talking. It’s perfect for all ages and I’d be surprised if any animated movie outdoes this one in 2019. How to Train Your Dragon: The Hidden World is not only a perfect family movie — it’s a near-perfect movie and a visual masterpiece. I’d be surprised if DreamWorks ever tops this amazing trilogy of touching and moving animated films and this consistently impressive saga will be remembered and rewatched for years. Go see it with your family in 3D when it’s out on February 22!